As we dance to new rhythms and settle into our new, more comfortable and weathered skins, we’ve emerged as The Farmer & the Butcher. 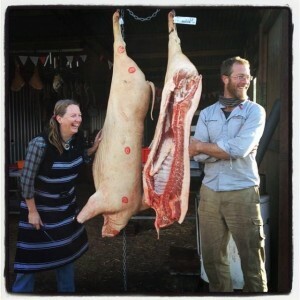 Stuart is Chief Farmer and I am Chief Butcher, though of course we both work out in the paddocks and in the boning room… (cue smirk). The patterns are fortnightly, with butchering weeks associated with abs runs and deliveries, and non-butchering weeks that allow for more Jonai power to catch up on fencing jobs, but also the accounts, vehicle maintenance, communicating with our lovely community, the plethora of odd jobs typical around any farm, a bit of writing, and plenty of activism in the fair food movement. It’s an incredibly full life, and we slipped all too easily into working seven days a week – not that hard to do when you love your work. But it was taking its toll, and on our recent trip overseas we took time to reflect before returning to the hamster wheel… and came up with Make a Day. We’ve said for years that we just need one more day in the week, so we made one. It’s commonly known as Sunday. We’re not that interested in a day of actual rest, so our Sundays really are Make a Days – each family member works on something creative that day. It might be cooking, sewing, designing a house, brewing beer, writing, drawing, painting… anything that you feel like working on, and wherever possible projects we can work on together. Introducing Make a Day gave us a new appreciation for rhythms and knowing when to switch off. I look forward to Sundays with the orsmkids, and in turn I also look forward to butchering and delivery weeks without that slight sense of hysteria that we will never keep up with everything to be done.